Human Tissue - Who can give Consent? Correct and up to date knowledge of consent for clinical care is fundamental to good clinical practice and patient communication. Most clinicians in busy wards and clinics will recognize that there is considerable room for improvement in seeking and recording consent at present from most patients in such locations. Furthermore, as case law on consent has evolved significantly over recent years as has guidance from the Department of Health and General Medical Council, the need for concise practical up to date guidance for front line staff is palpable. It thus gives me great pleasure to introduce this topical guide Consent, Practical Principles for Clinicians by Mr. Jeffrey McIlwain. It will be of use to clinicians, risk managers and lawyers. The clarity of presentation, in what is often a difficult subject for many of us, is especially appealing. While this short book is modestly presented as a broad overview to consent in clinical practice, it covers the subject matter comprehensively. For those who like to know that little bit more, the text is thoroughly referenced. While the context principally relates to English law and current clinical practice in the UK it will also be of interest to international readers in jurisdictions that often draws upon such principles. Jeff McIlwain is ideally placed to present such a guide to healthcare professionals given his dual surgical and clinical risk expertise and experience. The author’s approach to this subject is both conceptual and practical and is aptly illustrated with clinical and legal cases examples. A final ‘stretch yourself’ self test section provides numerous scenarios that will exercise healthcare practitioners’ key knowledge and skills in consent. Consideration of these scenarios will also be a bonus to medical practitioners presenting for Appraisal and for those seeking Revalidation as well as being an educational bonus for clinical training. If I may speak directly to those undertaking consent for treatment; you can be grateful that there is a handy book such as this as an aid to navigation in this field. This is a key item to buy and read now and to then return when uncertain waters reappear, as they will do. 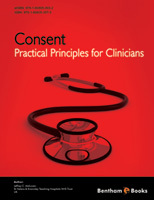 The clinician aiming for best practice on consent will keep this textbook close at hand and will re-visit it as a reference when new clinical challenges in consent are encountered. This book is a reflection of working in the field of consent for a decade by the author. The text takes a broad view of consent in healthcare rather than a large in depth review of large textbook / reference books. The aim is to give less experienced clinicians this broad overview with some depth around clinical consent to hopefully stimulate readers to explore deeper. There may indeed be errors within the text which are entirely the authors. There may also be differing views on interpreting some of the opinion. If this is the case I apologise, however, to ford the breadth rather than investigate the depth does mean that some detail or interpretation must be sacrificed. Nevertheless I hope that what is found within will be of value. No doubt those of a pedantic disposition will be dismayed by the use of hard and soft words and possibly quibble of the meaning of some expressions and their interpretation, however, the text should be viewed as an entity rather than a collection of erudite essays and it is the overall meaning that is important rather than intricate specifics. Many references reflect the era we now live in i.e. the use of the World Wide Web and so further referencing texts will point to such web sites. To some there may be a paucity of references. Those references selected are for illustrative or factual purposes or as a resource to follow. Most are as contemporaneous as possible. The author has avoided digest of opinion as that would mean that there is a presumption the author has read and understood all the texts rather than inadvertently citing references to demonstrate a provenance. Further for every opinion of ‘yea’ there is often a body of opinion of ‘nay’. The aims of the text and references are to show basic principles for clinical practice rather than digest of opinion or furnish the ultimate bibliography of all that has been written.